Have no fear in the storm, you and all who are with you, will come through it. Saying, Have no fear, Paul, for you will come before Caesar, and God has given to you all those who are sailing with you. Act 27:14 But after a little time, a very violent wind, named Euraquilo, came down from it with great force. Act 27:22 But now, I say to you, be of good heart, for there will be no loss of life, but only of the ship. 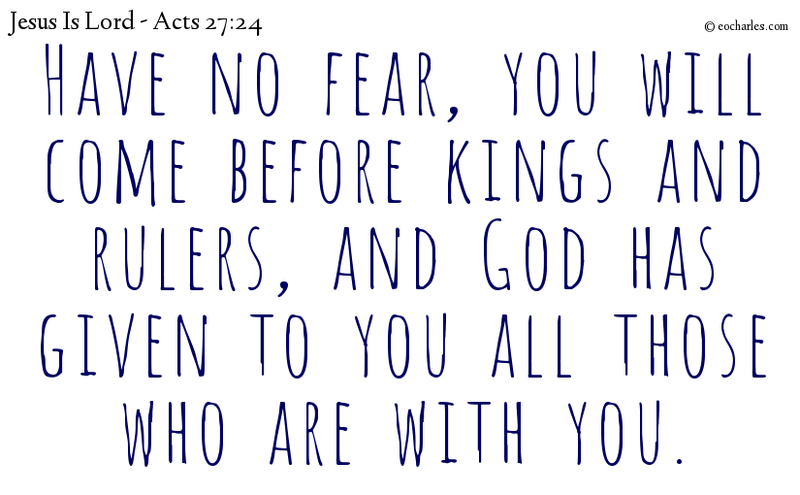 Act 27:24 Saying, Have no fear, Paul, for you will come before Caesar, and God has given to you all those who are sailing with you. Act 27:25 And so, O men, be of good heart, for I have faith in God that it will be as he said to me. Previous Previous post: To love someone is to tell them God’s truth, as it is seen in Christ.